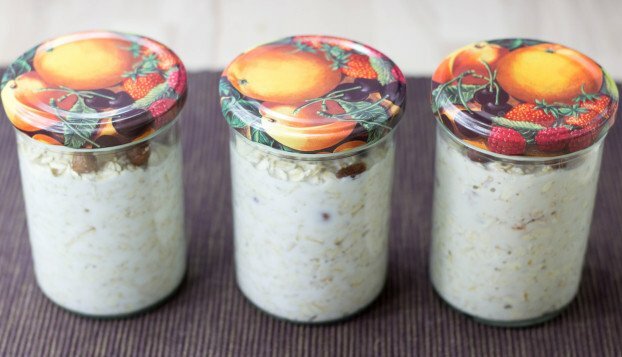 If your hand just went up then this How To Make Overnight Oats in a Jar Tutorial is for you. But if just the slightest thought of organisation has you shaking, then sorry, you’re doomed. Well, onto the tutorial then. The principle is simple: you add the oats the night before you want them, some kind of milk and your favourite toppings all in one glass and put them in the fridge. The milk gets soaked up by the oats and the next morning you have a delicious ready to eat breakfast waiting for you. I’ve prepared a flexible step-by-step instruction for you. Actually it’s so simple, even Kat and Dave’s cats would know how to make overnight oats after looking at the photos. Step 1: Take a glass or a bowl and add a serving of old fashioned rolled oats (basic porridge oats work a treat too). Fill the glass as much as you think you’ll be able to eat the next morning. 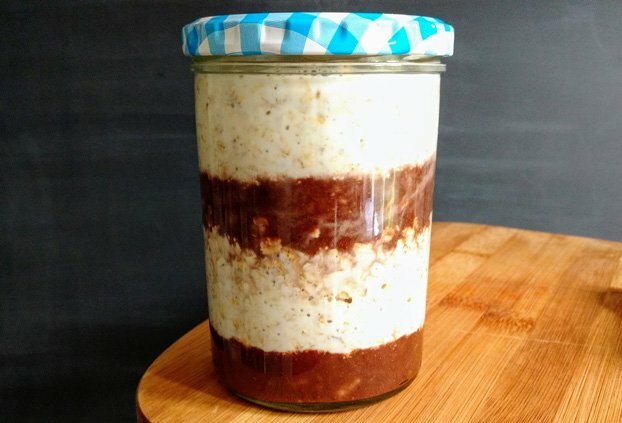 (Tip: if you prepare the overnight oats in a sealable glass/jar then you can take it with you to work in case you still run out of time in the morning. No excuses! Pro tip: add 1 tbsp of chia seeds for some omega-3s and even more protein). Step 3: It’s time to add your favourite toppings. Some ideas include: almonds, hazelnuts, walnuts, cashew nuts, flax seeds, chia seeds, raisins, all kinds of berries, fruits like banana, cherries, apples or pears, sunflower seeds, pumpkin seeds, nut butters, coconut flakes, greek yogurt, plain yogurt, the list goes on. If you like any of those suggestions with a little more crunch just add them in the morning. Step 4: Refine the overnight cereal with your favorite spices; for example cinnamon, vanilla, cocoa powder, ginger powder, gingerbread spice (perfect in winter! ), all work really well. Step 5: Lid on top and off they hop to the fridge. And that’s how you make overnight oats in a jar. Just get them out of the fridge the next morning, add a sweetener if that’s your thing (maple or agave syrup, honey, stevia) and enjoy! Really the easiest thing in the world, isn’t it? We’ve experimented a lot with different oatmeal recipes over the last couple of years. Some results were amazing, some were not so good. But it was all worth it! 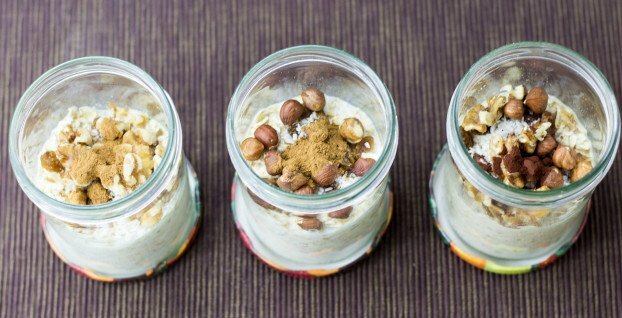 Let us introduce you to our 6 favourite overnight oats recipes! What great combo of peaches, almonds, lemon juice and maple syrup. All goes really well together, refreshing and filling at the same time. Tip: once peaches are out of season substitute them for pears. Dice the peach, chop the almonds and mint leaves. A beautiful mix of bananas, cacao powder and peanut butter. 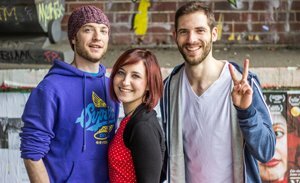 All three ingredients are known for their “affinity” to each other. You’ll taste what I mean! Mix the mashed banana with the cacao powder. To make it look nice first layer half of the oats and milk, then add a layer of the banana mix. Repeat. Finish off the oatmeal with a dollop of peanut butter. Get in a proper batch of tropical vibes every morning! Pineapple goes so well with coconut and vanilla, you wouldn’t believe. An excellent choice of milk would be rice or coconut milk since it complements nicely with the other ingredients as well. For extra fanciness: blend the pineapple together with the vanilla extract and coconut flakes. Layer oats and milk and pineapple mash one after each other. Throw everything in a jar, screw the lid on top, shake, and off it goes into the fridge. The next morning add a dash of milk, a sweetener (if you want) and enjoy! Who doesn’t like cheesecake? Nobody. And who doesn’t agree blueberry cheesecakes are the best of cheesecakes? Nobody. And this is why we tried to resemble this delicious treat fro breakfast. And I have to say it worked very well. Try out this delish combo of blueberries, lemon, yogurt and maple syrup. You won’t be disappointed! Throw everything in a jar, screw the lid on top, shake, and off it goes into the fridge. The next morning add a dash of milk, a sweetener (if you want) and enjoy. Another excellent combination of foods that match very well together: Grapes + Walnuts + Yogurt + Cinnamon = win! And on top of that the shot turned out really nice as well. A true oatmeal beauty. 1. How far in advance can I make them? Depending on what ingredients you take the overnight oats stay fresh for 2-3 days. This means that you can prepare 2 or even 3 servings at once and have breakfast ready in no time for several days in a row! Niceeee. 2. How long do the oats have to soak before I can eat them? Ideally let them sit for eight hours, but they should be fine after around four hours. 3. How do you eat them? Have them cold right of the fridge, or throw them in the microwave for a minute or two. We also find a spoon is helpful. 4. What kind of glasses/jars are ideal? Any jar, really. Just use some empty pickles jars to start off with. If you want to go the fancy pants way, get some beautiful mason jars (Amazon Link) to flash them off in the library or at work. 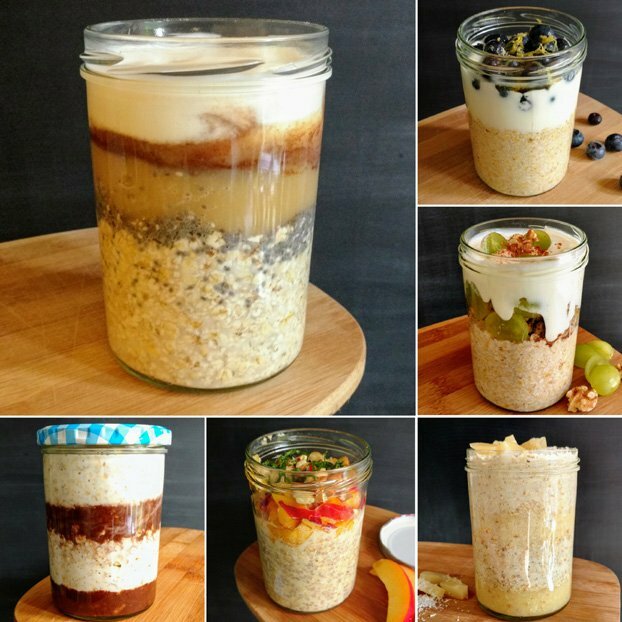 And if you’re looking for a really cool present, then you need to check out these overnight oats jars with a recipe printed on from my blogging friend Sophia! 5. Can I use steel-cut oats? Yep! They may be a little more chewy than usual, but a great trick is to leave the jar outside of the fridge for a few hours first. Soaking in room temperature will speed up the softening process. 6. Can I use yoghurt instead of milk? Sure! Kust make sure you give it all a good stir or pop the lid on tightly and give the whole thing a solid shake. 7. Can I use water instead of milk? Err, yep. It won’t taste that exciting though! 8. Do I add milk when I make them, or in the morning? That’s up to you, but we recommend the evening. The longer the ingredients have to soak, the softer they’ll be. If you use chia seeds, then definitely add milk the night before! 9. 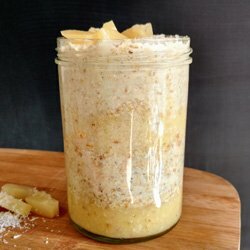 Can I add protein powder to my overnight oats in a jar? Definitely! You’ll want to add a little more liquid though and give them a good shake/stir to avoid lumps. 10. Can I use frozen fruits? Yes! They’re perfect, and will thaw overnight. 11. Do I need to put the jar in the fridge, or can I keep them out? Definitely depends how warm it is! For one night that should be fine – much longer and they’ll go bad, we wouldn’t recommend! 12. 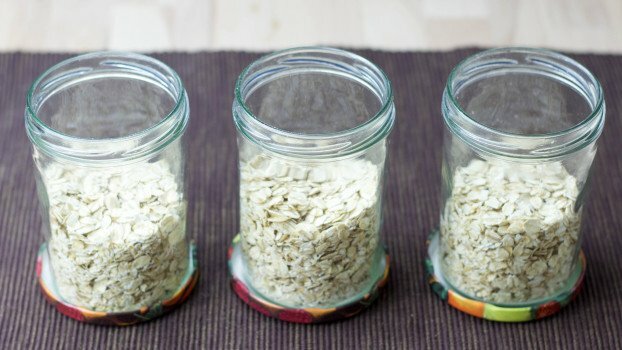 What’s the difference between rolled oats and oatmeal? I’m confused! 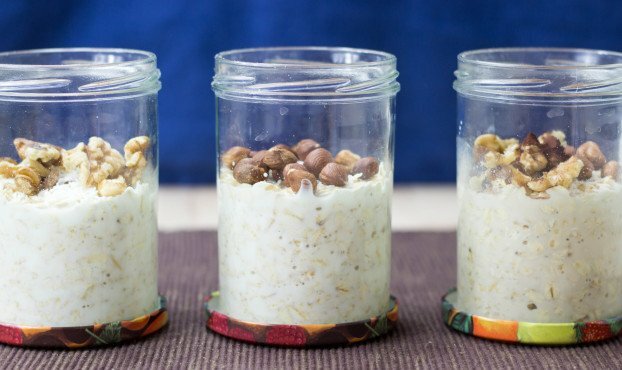 Do you have overnight oats for breakfast? If not, what’s your everyday breakfast? And finally, what’s your favourite kitchen tip? We want to know what turns a tiresome chore into a beacon of delight. Let us know in the comments below; just hit reply. 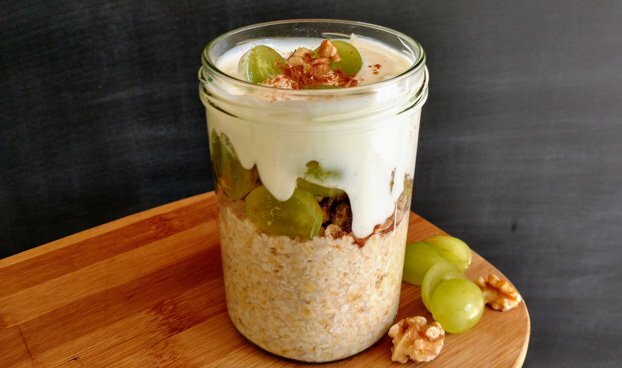 But let me introduce you to 29 scrumptious and healthy overnight oats recipes as well. 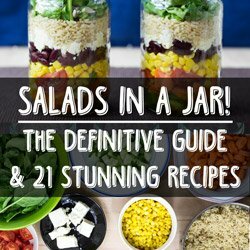 Before you go check out a similarly practical idea for lunch: we created a really thorough guide on How to Pack a Salad in a Jar. Enjoy! I love overnight oats and make them all the time! Have you seen the jar I created and sell on my site that makes for quick and easy overnight oats? It’s been a huge hit! Yess, I did!! I thought it was a super smart idea! Are there any steel cut oats recipes simalar? I used rolled oats and followed the recipe but the oats turned out flakey and not smooth or creamy. I used 2% milk. Was that the problem or the Red Mill extra thick whole grain oats? That’s what I had on hand. Would love to do it so it turns out right! Hi Nancy! Yes, I’m very sure it was because of the extra thick whole grain oats. Did it taste bad though? You can always add a bit more milk to loosen up the texture. Otherwise instant rolled oats would definitely create a creamier texture. How much and how do I order them? Thanks so much for including me in this round-up! 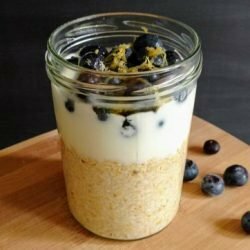 I love overnight oats, probably my most favorite breakfast ever, so I can’t wait to try some (or all of these)! hahaha, well I’m definitely also a muesli/oats/oatmeal fan. Since I stopped eating bacon, English breakfast isn’t as much fun anymore as it was before anyway. I was an overnight oats kick for a long long time several months ago. Need to get back that so breakfast is waiting for me in the morning. Some delicious sounding recipes here! I don’t think I’ve ever skipped breakfast – lunch maybe – but never breakfast – I adore all breakfast foods so much! And one of those breakfast foods I adore are overnight oats! Love the tip to add in chia – I always forget to do that! Scrambled egg and sausage (the precooked, frozen kind). Wow, Howie this tutorial is really awesome!! So helpful. I have never actually made mine like this because I always like to rinse the slime off of the oats in the morning after soaking all night, haha. But this is a great tutorial. Thank you so much for including my Cinnamon Roll Oatmeal recipe! Interesting! 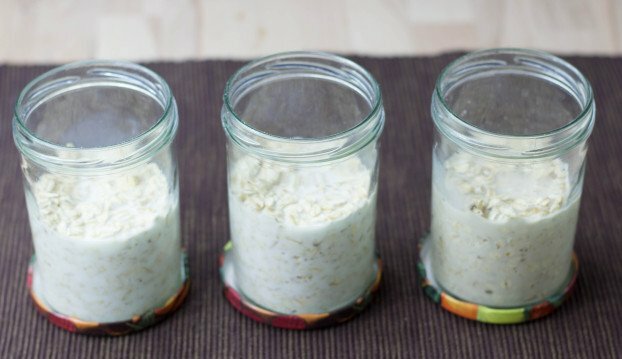 Never thought of rinsing overnight oats. I guess you don’t like them “unrinsed” or is there a different reason you do that? Well, I started making them this year, so I can actually believe you, hahaha. Great you could find some inspiration!! Great step by step instructions and photos. So simple and convenient. Thanks for the list of other recipes too. I love overnight oats and eat them at least 2 or 3 times a week. They are just perfect for grab and go breakfasts and keep you full for ages. I often take them to work with me for lunch too. Making them in mason jars makes them so easily transportable and perfect for eating at your desk. My favourite flavour combination is coffee and chocolate! Never heard of overnight oats before. Tried them this morning, and they were great. I like mine hot, so just 45 seconds in the micro. And just in time for the cold weather. Much thanks. I think I like warm oatmeal better than the overnight variety. But sometimes when it’s really hot, cold is nice too. I don’t really understand the obsession with the jars though. I feel like it is soo trendy to put all of your food in a jar, why? I guess it’s easy to transport, but there is also tupperware. Using glass jars is also better for the environment. Plastic wont disintigrate basically ever.. jars an serve another purpose if not for food. and def cheaper. Grab em at a thrift store. So you don’t heat the overnight oatmeal the next morning to eat? I personally never heat them up in the morning. I will admit that breakfast is not my most favourite meal. Makes it easier for my morning workout if I do eat. Oatmeal is such a great food source….and overnight oatmeal is the best. I don’t have to think about it in the morning…just open the fridge..grab and eat! AWESOME!! Interesting, what kind of sports do you make in the mornings? For me it’s super hard to get me motivated to do anything sportive at that time of the day. Hi, I’m sooo late, but I love oatmeal & all things good. In fact I have a brick oven I bake all my own breads, using ancient grains (modern gmo wheat contains toxic gluten) I fresh grind my grains & generally use starter instead of yeast. This is perfect for me. Does it heat up nicely, I love my oats warm. I hate sweets so I would have to adjust some recipes, not too much work, right? Thanks for your effort, great tutorial. I’m glad I discovered your site, love ❤️ it! I am so not a breakfast person, but, I love having 28 jars of inspiration. I think I will add some extra macadamia nuts. I was just looking for recipes for overnight oats. I would like to try them but haven’t made the jump yet….My only concern is the texture. Are they super chewy? Overnight Oats are like my favourite thing in the world to make for breakfast! Just love how versatile they are, the flavour combinations are endless! 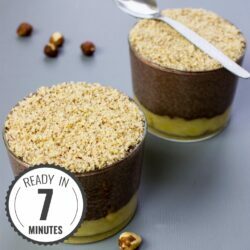 Great tutorial and flavour ideas! Orange juice?! You’re crazy 😉 But i like it! Recently i haven’t been having too many issues with getting my breakfast in in the morning, but as soon as winter hits I know i’m going to be hitting that snooze button way too much. I will definitely be turning to these babies for my breakfast! Have a great weekend guys! 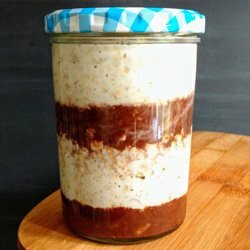 I have been wanting to try overnight oats here. I think you have me convinced! 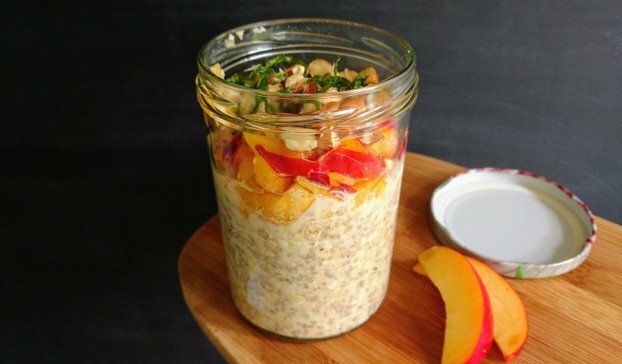 I’ve never made overnight oats but I should consider doing:) Great tips! Damn overnight oats and their easiness. I wish I could eat oats. I really love the convenience of overnight oats, the flavor combos are endless. I’ve been interested in getting into the overnight oats game. It certainly beats preparing them in the morning or going the instant route. Love these tips and recipes! I just discovered overnight outs earlier this Summer, this is a great resource for me, thanks for sharing, pinning! This is such a genius idea and I really need to start implementing it to make my mornings go smoother! It is my first year having kids in school and I always feel behind! It’s such a time-saver, sounds like it’ll be perfect for crazy school mornings! Ohhhhh, THIS is what overnight oats are! I actually never heard of it before. I’m making this to have for breakfast for my busy mornings! Friggen brilliant. 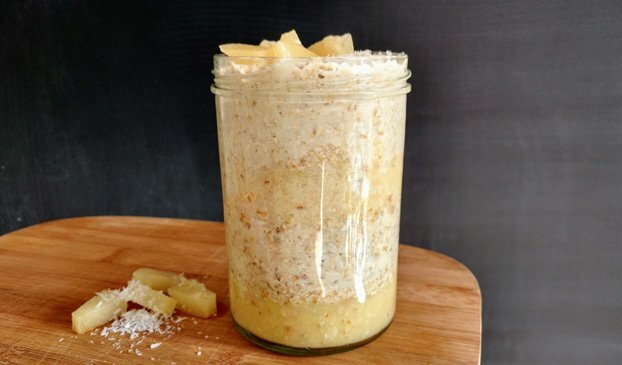 One of my favourite time savers is to cut up a few pineapples into bite size pieces and put them in the same type of jars as the overnight oats. I love having the fridge full of grap and go snacks. I think this type of prep is life changing because if you are surrounded by healhty grab and go snacks it will keep you away from junk food. Sounds like a good idea, will think of something. Oh wow! Thank you SO much for mentioning my jars! I totally appreciate your support! Ok..so a friend of mine told me about overnight oats and I was instantly intrigued. I am wondering about something and I hate to sound weird but, are people eating this straight out of the refrigerator or are they warming it up once they get to the office? My favourite is to add 0% fat flavoured yoghurt (my favourites are the banana custard and toffee Müller lights) and chopped banana. How does this work with frozen fruit? Does it thaw by morning, or do I need to thaw it first? how would steel cut oats work with this? Should I let it sit longer? I’m not sure, unfortunately Eva, since I never used steel cut oats. But I don’t think it’ll work, also because I’ve never seen an overnight oats recipe with steel cut oats. I made my first overnight oats with steel cut. They were great! I used 2:1 ratio milk and oats. Lotsa milk, which i like, but oats werent crunch y or tough…had a nice firm texture. Why can’t we add avocado in the jar of overnight oats? Hi! Can I use water instead of milk? 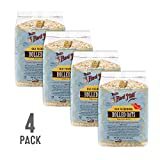 Are we talking about Quick oats here, or rolled oats? Or maybe it doesn’t matter? Hi, I just started looking up at overnight oats and ur recipe sounds simple and yum, definitely going to try it soon. A question though, does it have to go into the fridge overnight? Doesn’t keeping it outside but cool work? Coolio, hope you like them. Yes, keeping them outside the fridge for one night would also work, but of course they are not likely to stay fresh for for three or more days. I really want to do this right now this second but it’s 3 in the morning o.o guess i’ll have to wait another day. Instead of milk, could you add chocolate flavoured oatmilk? Or is it to much with oatmilk on the oats? Hi , Can I use precooked oats? 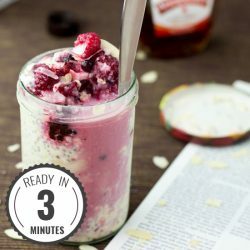 ( Oats that can be prepared in three minutos? Thanks so much! Purchased my jars yesterday and can’t wait to start tonight! We cannot eat with a spoon at our desks in work can this be blitzed to be a drink rather… do you have any recipe ideas? Can you make several in advance and freeze them (and maybe thaw in the fridge the night before)? Is there a reason why we put the fruit in the night before instead of having them freshly included the morning after? I think the oats have time to absorb liquid. Can you use frozen fruits in this recipe? We run a Bed & Breakfast in Newfoundland, Canada and it’s 1.5 hrs to the closest store with any type of good fresh fruits or produce (seriously, I’m not exaggerating). I can buy all type of frozen berries, mangos, peaches etc, but have a heck of a time finding fresh. I’d LOVE to serve this as a breakfast option since we’re in a National Park where hiking is the number 1 activity for tourists. Also, if I doubled the quantity would I have to adjust any of the ingredients? Thanks for any feedback,,, this recipe sounds amazing and can’t wait to try it for MY breakfast. Yes, frozen fruits work absolutley fine, berries especially. I never tried frozen mango, but I can imagine it’ll taste sublime. Yes, for bigger servings I’d just multiply all ingredients, no exceptions. Hopefully they’ll be a success at your BnB! hi! can i not put the jar in the fridge overnight?? Greeting from Indonesia.Thank you for lots of variations to prepare overnight oats.Berries don’t grow in tropical climate.Can I use tropical fruits like pineapple? Absolutely Ariana! But with pineapple you need to watch out! In combination with cow milk it turns bitter after a couple of minutes. Last time i tried overnight oats i didn’t like the texture. But I’m inspired to try again! At the very least, it may reduce the cooking time in the morning. Also a great way to use frozen fruit. I also have a hard time getting my daughter to eat in the morning, but she might like this without the added morning cooking (and cooling) time. Thanks! Good look with a second try! Cool recipe! Do you mix it all together before putting it in the refrigerator? Or do you mix it in the morning when it’s ready? I love overnight oats and I make them for my step-mom sometimes when she had early mornings. Though, she found that they had a little “bit” to them. So, her being a textual person, I’d pour over boiling water and cover for 5-10 minutes. Then prepare as regular – still using milk (any varient), but you probably won’t need as much. When you make them, testing them to make sure the flavor’s on point, it’s hard not to eat the whole thing. Good Mix: about 1/3 C milk, as much cinnamon as desired, about 1/2 – 1 T brown sugar, and any kind of fruit (berries pair very well with this). 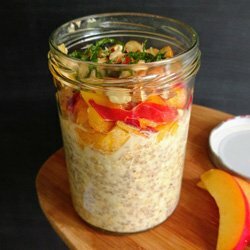 Love overnight oats! They have been my go to breakfast for a couple of years now. I, however, use equal parts oats, yoghurt and a smattering of anything fruity or crunchy that I have on hand that weeks. The oats take the liquid outs of the yoghurt and makes it super creamy. I make three or four and a time, put them in my work fridge and voila – winning at life! Really amazing! these many types of oats recipes are there,Surely I can prepare it to reduce my weight. I am really shocking because i know only two type of recipe that also very bore to eat repeatedly. Thank you very much your post. Glad we could help Shannon, and thank you too for the compliment :). Enjoy! I have steel-cut oats, not rolled oats, so I don’t know how this will affect overnight oats. Another recipe of yours, Cottage Cheese Pancakes, worked with steel-cut oats, after I ground the oats in a blender so it looked like flour, before mixing with the other ingredients. My steel-cut oat container from Whole Foods gives a number of ways of preparing them, including regular stove top, crockpot, and overnight, but I only used the stove top so far. Their overnight instructions say that boiling the liquid first before mixing and putting in the fridge reduces cooking time but doesn’t eliminate it in the morning, although it says to use low heat the next morning, I am wondering if the instructions for heating the next morning are only if you want to eat it warm instead of cold. I hope they turned out good! Yes, you can also use steel cut oats for overnight oats, but they might be a bit more chewy than rolled oats. A trick to make them softer is to leave the overnight oats jar outside a fridge for a couple of hours. Room temperature makes them go softer more quickly. This may be a weird question, but can I use oatmeal packets to make this recipe? I have a lot of them on hand, but I don’t like to “cook” first thing in the morning…. I am guessing that I wouldn’t need to season them, as they are mostly flavored packets, but how many packets will I need to make the overnight oatmeal? One? Two? I’m sorry if I seem a little frazzled, but I cannot afford to waste anything right now. Hi, I love all of your recipes for overnight oats but a couple of them are going to the wrong page. I clicked on Superfood Overnight Oats and Cinnamon Roll Spice Oatmeal and those links actually pull up the apple cinnamon oatmeal page instead. I then typed in the name of those oatmeal recipes and your page said the page was gone so I was hoping to see if those could be added again. Thanks for your help!! I can’t wait to make these for myself and my son for in the mornings. I just dicovered them and yes they are awesome. Thanks for the tips guys! I had no idea what rolled oats were so I just bought the regular oatmeal. Will that work? You’re more than welcome, Bevs! Yes, you can always mix and match to create your own personal, awesome versions of course. Enjoy breakfast! I’m starting a meal plan soon and this sounds like the perfect quick breakfast (which I struggle with in the am) Just to clarify, are these meant to be eaten cold? Also, will water still do the trick instead of the other liquids mentioned? Ah interesting stuff; what kind of meal plan are you trying out if I may ask? I usually eat them cold. But if you wanted to you could warm them up as well. I have never tried these but just wonder if it is ok or good to heat them up in the morning? I would not like it cold. Would that work? Have always been the type who forgets to eat breakfast… tried these recipes out and it was awesome! Thanks so much! I love the sound of these, but will whole grain oatmeal work as well? I am trying to eat more whole grains for health reasons. Since several people mention they don’t care for breakfast foods or sweet things, I wanted to share this. I sometimes make steel cut oats (the regular way, on a stove top), but I make them savory: salt, pepper, basil, sun-dried tomatoes, grated Parmesan cheese. Maybe some people would like this idea as an overnight recipe, but take them for lunch if they don’t want something this savory for breakfast. I wouldn’t put the cheese in overnight, though. I would add it right before eating and would probably be better heated up. Also, would use water for this instead of milk. Can still add chia seeds, walnuts or slivered almonds, and a little olive oil. Oh I like the sound of this savoury oats dish. Also a savoury Asian version I love… oats soaked overnight in water. Stir fry in a little oil, around a 1/4 cup of carrot, broccoli bits and the desired amount of finely chopped ginger (I use half a thumb). Add a soup spoon full of the oats and cook till thick. Add your favourite salt seasoning to taste and some chopped coriander if you like it, then garnish with 3 drops of sesame oil. Bliss. Just tried the basic recipe for the first time. So good! Made an overnight oats believer of me . I’m a dietitian; I’ve been referring clients to your site. Some recipes suggest layering—so should you not shake those ones before putting in the fridge? Oats will still be fine? Also, how come the basic recipe has 1 cup of milk but most of the 6 favourites have half a cup? 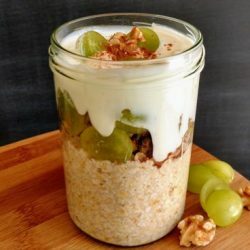 So glad you enjoy these overnight oats recipes!! Also thanks a ton for referring us, that means a lot to us actually. 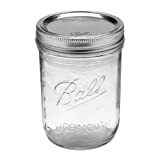 Good points: Yep, some photos suggest layering – and it’s basically to make the jar look pretty, nothing else. Though I always would soak the oats and chia seeds with milk. The other ingredients don’t have to be soaked, necessarily. About the half a cup vs one cup – good catch! Both works, but the more milk you use the “mushier” the oats get. So, I think it’s what you prefer really. Have you tried any using the flavored coffee creamers? I just found strawberry cheesecake flavored coffee creamer. I think I will try one of these using it. Also, with people that want to add water, couldn’t they put a bit of powdered milk in it? We do something similar for camping, using the powdered milk then hot water when you want to eat it. Is it necessary to sweeten the oats in the morning? I use liquid stevia. Could it be added the night before? 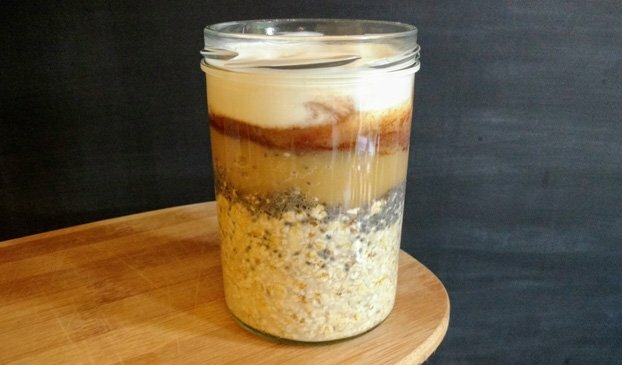 must the overnight oatmeal be prepared only in a glass container? 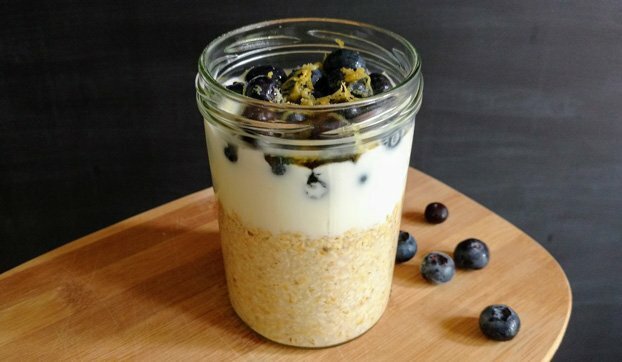 Can you use cooking oats? My Doctor told me I need to eat the ones you have to cook on the stove, not the instant ones or anything like that. If I can use the cooking ones, do I have to cook them on the stove first, then do all this or do they also work the same? Hi Chris! By cooking oats do you mean regular old fashioned oats instead of those instant cooking oats? Yep, those old fashioned oats work fine as well! Is it okey if I soaked all my week-mornings oats through sunday (8 hours), put them on their respective tupperware, put them on the fridge and each day i grab one and cooked it? Is the soaked oats of sunday next week (7 days in the fridge) gonna be okey? No mold? Hello, in the program that is made for gaining muscle, it’s written that it’s 450 calories, but in this page it’s 350. What is the difference? Thanks for all the recipes. Trying to lower cholesterol and just going to eliminate fattening stuff. You’re very welcome, Cindy Lou! Do they have to be made in a jar? Can a plastic container with a lid be used? Hi Diane! Yes, almost any container with a lid is fine. If it’s for transporting, do make sure the lid really sticks on tight! I made overnight oats with almond milk and Greek yogurt. In the morning husband likes to add hot almond milk before eating, he can’t eat cold oats, is it safe to add hot milk to the yogurt mix?? There’s no instructions on the APPLE INC.” which I am just abouts to make I think a couple others had no instructions either but so far I’ve tried the banana and choc and the pineapple coconut I’ve never had over night oats before and first mouth I was a bit worried about the cold but I absolutely love them now more then when they are warm thank you for these delicious recipes! I’m trying them all out! Actually, kust today I convinced my girlfriend to try them as well. She was similarly surprised like you, haha. About the instructions: I left them out because I thought it was self-explanatory. What do you think? Love all of the ideas for recipes. Can you use a vanilla protein shake as the milk substitute? Has anyone out here tried that? If so, how did it taste? I’m very interested in the refrigerator oatmeal. I can never find exactly what i’m looking for at one site. So hopefully you come across and discover more options that I’m interested in trying so I won’t need to spend all day searching different sites to figure out a game plan. Very easy breakfast recipe. Thanks. I love oats. Thanks for sharing. healthiest foods you can eat and ready right out of the fridge. No time – no motivation to cook dinner – I eat one! Haha, indeed! They’re a great snack for any time of day. I have some with me today and they’ll be a great brunch. Glad you’re enjoying them, Miguel! Hello! 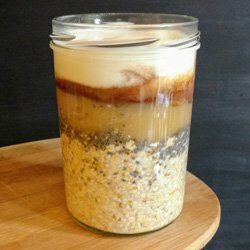 I’m planning on doing this overnight oats later,but I just have one question left.Can you use something else other than a jar? Haha yes, they do tend to get snapped up pretty quickly! I sort of discovered this method myself a few years back. I make mine in a 550ml clip-lock tupperware pot (sold for soups mainly) and throw it in my commuter backpack. Takes only a minute in the evening and you can make endless varieties!